When Jeanhy Shim, her husband and their then-toddler moved into a condo in Bathurst Quay in Toronto seven years ago, they were the only young family in the 360-unit building. “There are easily a couple of dozen families there now, with kids from babies to teens,” says Shim, founder of Housing Lab Toronto, an independent housing research think-tank, and a consultant on more than 100 residential projects in the GTA. While families raising kids in condos was fairly rare a decade ago, it’s a trend that is gaining momentum in Toronto and some parts of the GTA, fuelled both by the affordability challenge of other housing options and by some urbanites’ desire to stay close to their jobs and city amenities after they become parents. While some condo developers are addressing this market niche, according to a November 2017 report, Bedrooms in the Sky by Ryerson City Building Institute and Urbanation, not enough family-friendly units are being constructed in the GTA to meet the expected boom in demand over the next decade, as 35- to 44-year-olds seek family-friendly housing of two bedrooms or more in size. The raising-kids-in-condos phenomenon hasn’t yet caught on in any significant way in other Ontario urban centres. One reason is that single and townhouse prices remain relatively affordable in areas such as Ottawa, Kitchener-Waterloo and Hamilton, and those types of homes remain the preference for buyers with families. “We’ve definitely seen a steady rise in demand in the past 10 years, and in the next 10 years it will be much more significant and will happen really quickly,” says Jared Menkes, vice-president of high-rise residential for Menkes Developments. Shim and her husband were among those who didn’t aspire to the suburban dream. They knew they wanted to stay downtown and would be raising their child in a condo, even though there were no amenities for children in their building. When her now nine-year-old daughter was younger, Shim and other moms would gather in the condo’s party room and bring toys and snacks; and their neighbourhood is well served with parks, greenspace and trails. That’s why it’s important to have dedicated amenities for children, says Menkes. “They shouldn’t be running around adult-type spaces.” Menkes Developments was among the first condo developers to incorporate dedicated child-friendly amenities with The Eglinton. Their midtown Toronto building includes a child’s play area, designed with input from child development experts Ellen Yack and Cindy Smolkin. When buyers move in later this year, young residents will enjoy an outdoorsy-themed, glass-fronted, 400-square-foot room with areas for kids and parents to read, listen to music or play. 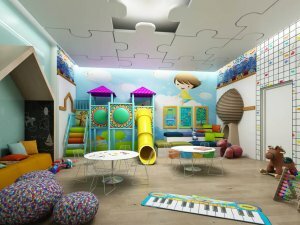 The company has also included large indoor and outdoor kids’ spaces at its Harbour Plaza development in the South Core Financial District. 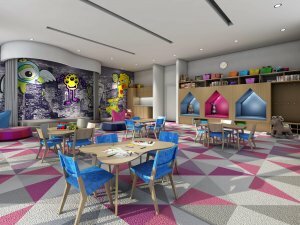 Tridel is providing amenities for two different age groups in some of its buildings, with children’s zones for young kids, as well as wifi cafés where teens can socialize and plug in their devices. Tridel’s West Village at Etobicoke includes a children’s zone, while its Islington Terrace at Bloor and Islington includes a play room, outdoor play area and splash zone. The Wesley Tower in Mississauga and Wyatt and DuEast condos in Toronto, all Daniels projects, will have kids’ zones for play, craft-making and reading and are supplied with toys. Wesley has indoor and outdoor play spaces with slides, and a glassed-in room for parents to supervise from. 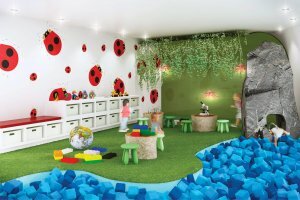 Condo play rooms for kids typically are decorated in bright, primary colours and include indoor climbers, low chairs and tables, toys and comfortable seating to snuggle with parents. At the downtown Concord CityPlace master-planned community (bordered by Bathurst St., Lake Shore Blvd. and Front St.), Harbour View Estates condos share a SuperClub with a basketball court, outdoor playground and pool where kids can take private swim lessons. The sod has been turned for the Canoe Landing Centre, to include new Catholic and public schools, a daycare centre and community centre, with opening slated for late 2019.
towers, they are popping up in the design of master-planned or mixed-use condo communities. A new daycare, for example, is being constructed at CityPlace. There is also a new facility in the Emerald City neighbourhood of North York. And daycare centres also dot Regent Park and Maple Leaf Square, among others. That’s one reason Menkes’ 87 Peter Street condo in downtown Toronto will have lockers on the same floor as suites, so parents can store all the equipment that kids require. Tridel is designing entryways that are big enough for strollers and looking at double-sized laundry rooms that can hold shelves, cupboards and ironing boards. However, Ritchie notes that to accommodate these type of features, something has to give in terms of floor plans, such as the ensuite bathroom. Designing larger suites is the easy part. Finding the balance between delivering what the market may need down the road while making projects economically viable for developers is a more delicate issue. Shim consulted on the six-storey Southwood by Streetcar Developments at Kingston Rd. and Southwood Dr., one of the first condominiums designed with family needs in mind, with features such as oversized closets. She also consulted on George condos by the Rockport Group, a midrise in the Leslieville neighbourhood. George has an outdoor kids’ area and well-designed functional floor plans. Shim held pop-up events to promote the oversized balconies that can accommodate outdoor furniture, a barbecue as well as kids’ tricycles and toys. Other developers don’t specifically target families in their marketing. Ritchie says by looking at suite sizes and amenity packages, buyers can deduce whether a project will suit their family. Daniels has found that three-bedroom suites of 1,000 to 1,100 square feet work well—anything less than that is not functional, says Tompa—and are still affordable, compared to other types of Toronto housing. That size allows for adequate closet space, living and dining rooms large enough for communal gathering and either two full bathrooms or a powder room and bathroom. The third bedroom might not be large, but has enough space for a bed and desk. Developers such as Tridel, are also putting three-bedroom suites on lower floors to keep them more affordable (the higher suites are in a building, the more the price increases). location. Even at prices significantly less than single homes or townhouses in the city, family-sized condos may still be financially out of reach for many families, and they have to look beyond the 416. Builders such as Geranium Homes and Kaitlin Communities are among those offering stacked condo townhouses at budget-friendly price points in neighbourhoods suited to kids. In Stouffville, Geranium built 120 stacked condo townhouses (Vista Flats & Towns) in four-storey buildings as the last phase of its master-planned Cardinal Point community, starting in the low $300,000s, and sold them out last year. Surrounded by greenery and just down the street from the main community parks, it is well suited to families, says Stephanie Lane, sales and marketing manager for Geranium. “A lot of first-time buyers purchased because of affordability, and we had some people with small children, as well as empty-nesters, buying two-bedroom towns,” she says. “The open concept works well, as parents can see their kids while they work in the kitchen. And there’s a central promenade where children can play. It’s great for a starter-family lifestyle and Stouffville has a ton of amenities.” The latter include an arena and GO station less than five minutes from the site. Kaitlin’s Lakebreeze community in Clarington has stacked and back-to-back townhouses among the mix of housing styles. They start in the low $300,000s for a 650 sq. ft. unit and in the low $500,000s for a 1,350 sq. ft. plan. The units include features such as extra bicycle storage in garages, digital locks (so kids don’t have to worry about losing keys) and programmable EcoBee thermostats. Buyers at Lakebreeze can use the clubhouse at Kaitlin’s Port Newcastle site, just a short walk or bike ride away, that has a pool, kids’ programs, fitness centre and movie nights. While children are expected to be part of the mix in low-rise neighbourhood such as those, will childless condo buyers be as accepting of youngsters in their hallways, elevators and common areas?